@DanKeshet @cathcam Warehoused cars get driven far less often. It’s not perfect but best we can hope for right now. @cathcam Yup. I’m trying to understand if they’re “needed” because required by policy, required by investors, or desired by devs. 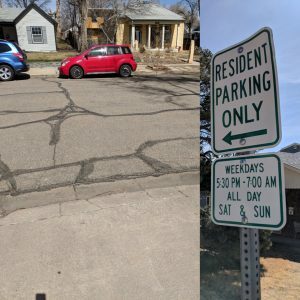 I got some interesting responses on twitter about my parking madness post. Yes, if was writing a critical analysis, I should have covered all those points, but then the blog entry wouldn’t have been as catchy and would have taken too long to read. Here are some more serious observations. @mdahmus aka M1EK is someone whose opinion I can almost always appreciate, and mostly always agree with. Mikes point here is that the garages are not such a bad thing. It assumes that people own cars, put them in the garages and use them less as they live downtown and have no need for them. Right Mike? That is a reasonable position. However, it doesn’t make the building of these garages on valuable land within 1/2 mile of city hall. If we restrict parking, forcing up prices, there will be either an uproar or push for alternate transportation solutions, or the prices will rise to what the market will bear. This was my experience living on the central east side in Manhattan. I owned a car, but simply couldn’t afford to overnight it in Manhattan. Had I worked in Manhattan I wouldn’t have needed a car for the most part, but I worked some 28-miles outside the city. Driving to work was quicker than taking the train, sometimes the traffic delays getting home would push the time beyond taking the train, but for the most part it was quicker. The problem was the overnight cost, and on those days where I wasn’t at work, it was next to daylight robbery. Solution? Rather than pay $40 to park in Manhattan, I paid $4 to park at Goldens Bridge Metro station, I’d take the train up and drive the rest of the way. At weekends if I needed the car, I’d either get up early, or drive the car home Friday evening. You rarely ever see them building dedicated parking garages in NY City or other major metropolitan cities anymore. The likelihood of these ever being torn down is remote and they with the others will remain as temples to the folly of the lack of usable transportation policy outside of the car. The city requires that number of parking spaces for the development that it goes with. 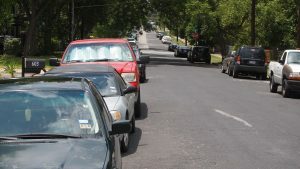 If this is the case, then it’s the city that is at fault, Certainly in downtown and the central corridor between Lamar, I35, Barton Springs Rd, MLK this needs to be changed, the developments are either too big requiring too much parking, or the parking garages are wasting valuable land, especially since they are not integrated into the building. The developer feels the property/development won’t be viable without all those spaces. There are two answers to this, one the city needs to revise it’s transportation policy to make these potential buildings viable without huge parking garages; or the developer should scale back the building. If that means he development isn’t viable, so be it. We don’t need to waste the opportunity to redevelop these lots with oversize buildings, subsidized by inflicting additional car journeys, noise and air pollution, as well as the inevitable light pollution as in the Hyatt garage. The garages are not really required either to support the development, or are required by the city. In this case the developer has calculated that these are money makers, it’s a land grab, literally. Still, as far as I can see, despite some sage commentary on twitter from people much more knowledgeable than I, but it remains these garages/carbuncles simply should have never been built. The city needs to act now to stop further parking madness. For the record, I live in a single family home, less than a mile from here, I have a detached garage where I keep a car. I ride my bike around town as much as I can, even for meals and nights out. I also use car2go when I can, and Dadnab was one of my original Austin friends.